External view of the "Coffee Stop" box. 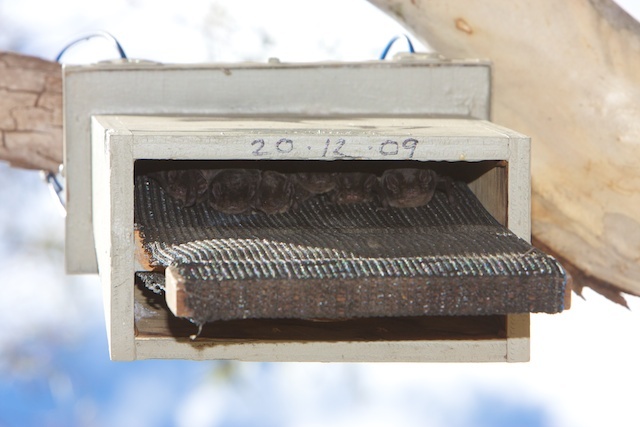 This entry was posted in All and tagged bat boxes, Bats in Perth, wildlife nest boxes. Bookmark the permalink. Great to hear from you again. Love your email. You should be a prolific writer…fantastic…. Okay, the grey bat box in the bottom photo under (DIY bat box) page is my current design. The sloping bottom is for the guano to fall down and out. In my past experience I find it builds up and they don’t like it. It breeds little mites. The bats are always cleaning themselves. Anyhow, they swoop from below the box and land on the mesh. Then climb up through the small gap and into the box.They tend to go up and hang off the walls and roof. 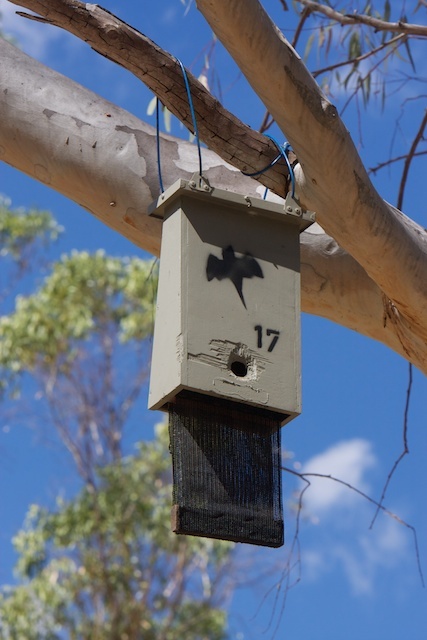 The first photo in the (DIY Bat box) page is an old design. In this photo the roof is open so you can see in from the top. Notice the floor is flat and not sloping. Also I have a white cloth jammed in the entrance to stop the bat from flying away. When I open the roof they all move down to the entrance and try to dash away. They think a predator is trying to eat them. I watched your rocket house video and it sounds like a good idea to have the sand as a temperature stabiliser, so with your bat box, why not add in another board behind the front board, with a 30mm gap filled with sand. Thanks for the idea Alan, It would be worth a try. I have some temperature loggers that I could use to record what temps a “Sand front Board’ type vers a normal one would be like. Your comments are much appreciated .